Why do I need your help? I am a person after two neurosurgical procedures in which they cut me a meningioma, which is overgrown with the central artery. For this reason, I was just about the second surgery. Sorry, but the tumor can not be removed in its entirety. After the first surgery I was in the Oncology Centre where I was exposed – unfortunately, but I am up to 95% of those in which this type of tumor irradiation has no effect. After the operation I was left with many diseases. 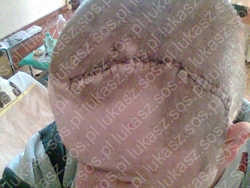 Among other things, the weakening of the right side of the body (arm and leg), facial paralysis, slurred speaking and what hurts me most is the loss of the left eye, which, unfortunately, to operate on the tumor had to be damaged – in other way reach the tumor, unfortunately that did not work because it was in the inside the skull. In addition, during the operation as a result of constant stress and ill-being revealed to me celiac disease , which is a disorder of the small intestine and does not allow me to eat anything that contains flour, including eg bread and pasta. For this reason I have to buy special food – they cost me, along with the maintenance of 2300 zł per month. Sorry but I refuse MOPS any assistance exceeded due to the social minimum, which is very low: 351 zł. These minimum downloading exceeds even my social benefits because it does not have enough years of work and ordinary annuity I should not. For this reason I go to work despite a medical doctor forbade me to work due to severe health conditions. Luckily I found a sheltered workshop where access takes me an average of 90 minutes. Somehow I suggest, but the salary he receives is not enough for me on my diet, and I would like to submit additional rehabilitation. Now I can not even go to the doctor when I need it. Throughout the year I take from 4-5 days of sick leave to visit only the main clinics. Fortunately, my mom, but she can not go anywhere because of the diseased hip, an operation which would have to wait a few more years. My father does not pay child support, or in the past and refuses to them until now not allowing me to purchase the necessary equipment to rehabilitate me. Studies not even started, because of brain tumors was not able to pass the exam. Currently I have a problem with memory and severe headache . The doctor informed me that, unfortunately, but after the removal of a tumor the size of the complex hand is already fists. He gets a special pain medication prescription, which, fortunately, help me, but after taking them I feel a little “unable to think”. I live in an apartment over 100 years in which to burn in the furnace for central heating located in the kitchen. I bring coal from the cellar. Sorry but I can not afford to change the heating. With the furnace sometimes emits fumes and smoke. Last year almost ended up in hospital because of poisoned by smoke us by a neighbor who smokes in an oven in the absence of authorization from the rest of the neighbors to use the chimney. So here is my life, and in time will be even worse because they do not become me to improve my health, and how everything is going uphill. If you would like to help me at least the minimum amount, even sending me stuff (especially gluten-free food) I would be very grateful.